In some new product development (NPD) organizations, managers may feel that they are herding cats. Other organizations embrace a different approach and produce better Development Experiences [DX]. Herding cats is an idiomatic saying that refers to an attempt to coordinate an intractable situation where individuals that are part of a team tend to do very different things. A manager may say “Managing developers is like herding cats” or “Managing designers is like herding cats.” When managers use this phrase, they may be invoking a stereotypical treatment of specific contributors. Alternatively, the phrase may be used to convey the frustration that arises from moderating disagreements between groups such as marketing and engineering. One humorous treatment of this type of situation was depicted in the Cowboys Herding Cats advertisement in 2000. The prevailing development approach relies on explicit coordination. The roles and responsibilities of individual contributors are documented extensively. Processes and checklists govern day-to-day activities. Resources are considered to be interchangeable. The common belief is that one engineer can be substituted for another with similar qualifications. It is assumed that the development environment is relatively stable and predictable. It is assumed that the cat herder will be able to manipulate behavior within the development environment. It assumes that the cat herder knows the criteria for success. Cat herders shop for cat herding tools that incorporate the latest technology and fads. They do not refer to their tools as cat herding tools. Cat herders transition from deadline to deadline. Some individual contributors may be satisfied producing specified deliverables on specified dates. They may be glad to be working in an environment that embraces hand-offs between functional groups. The previous experience item includes a representation of an individual’s knowledge, skills, and capabilities. Some relevant experience is a result of specific training and deliberative practice. Analyses is a problem solving approach that divides the whole into its constituent parts. Synthesis is a process of connection. It generates something new and different. 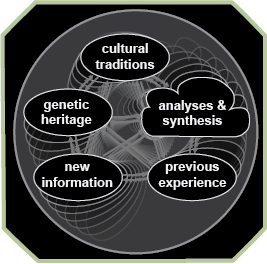 Synthesis benefits from inputs from a network of individuals with a diverse set of specialties. A synthesis approach enables one to imagine how a series of techniques may work together to produce the desired result. Orientation can be defined as the way an individual approaches development. The appropriate orientation provides a unifying focus that pervades the development environment. The literal translation of schwerpunkt is “difficult point.” Carl Philipp Gottfried von Clausewitz (1780–1831) described schwerpunkt in “On War” which was published posthumously by his widow in 1832. Schwerpunkt conveys strategic objective, goal, or destination. Schwerpunkt is any concept that provides focus and direction to development. It provides actionable guidance in situations where there are no explicit directions. It reinforces mutual trust. It contributes to a focus on the results. Schwerpunkt is a concise version of your strategy. It can be communicated in one sentence. In a military context, a schwerpunkt example is “Control the city in 72 hours.” For the Toyota Production System, it is about shortening the time it takes to confer customer orders into vehicle deliveries. Schwerpunkt is “A focusing agent that naturally produces an unequal distribution of effort as a basis to gain superiority in some sectors by thinning-out-others.” (Boyd, Patterns of Conflict 78) Schwerpunkt guides individuals when they set priorities. It clarifies what to next to add value to your efforts. The preferred orientation is implicit. In a development context, the intended meaning of implicit is closely connected, joined, interwoven, and intertwined. It is what you do without prodding from cat herders. When a well-crafted, shared orientation exists throughout a development network, the development experience will be characterized by an abundant amount of cooperation, collaboration, and harmony. The development approach will be more recursive. Problems of a similar type will be solved instead of waiting for handoffs. Small continuous adjustments that are created simultaneously across specialties will cumulate and create substantial change. Needs are anticipated. Dynamic adjustments are made. Multiple interdependencies are managed. Friction is diminished. Network efficacy, the shared belief in its capacity to successfully develop a specific item, increases. In preferred NPD environments, schwerpunkt should not be about herding cats. The predominant metrics should not highlight process metrics. It should recognize individual contributors as knowledge workers and value contributors. Instead of focusing your efforts on herding cats or gaming the cat-herding-system, I advocate investing to develop better implicit orientations. This enables the development of a compulsion loop that can become a vital driver to sustain a vibrant new product development environment. A byproduct of this approach is a series of great products that are associated with great user experiences. What is the schwerpunkt of your development environment? This post included extracts from the book “Developing Winners: Assimilating the Insights Encapsulated in Boyd’s OODA Loop” by OpLaunch founder, Mark A Hart.